Are you looking for a job where you feel that you make a difference? Are you passionate about certain causes? Are you someone who generally enjoys phone work? Then working as a telefundraiser at Causeworx might be something for you to explore further. 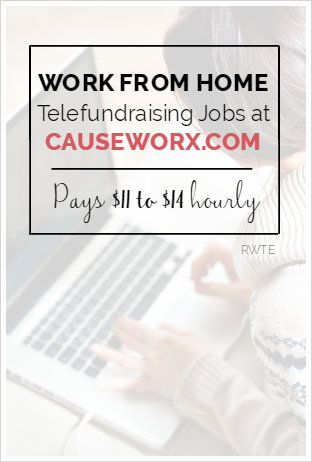 Causeworx is a Canadian company that hires workers worldwide to make fundraising calls from home to some of Canada’s most prestigious non-profit companies, hence the title “telefundraiser”. However, this is not considered telemarketing, since it is NOT cold calling, but calling from already present databases of people who have made similar donations in the past. Some of the Canadian non-profits that you would be calling on behalf of would be SickKids®, Covenant House, Ottawa Humane Society, Toronto Humane Society, The Fellowship, Sunnybrook Health Sciences Centre, and Union Gospel Mission. You may work full-time or part-time in this position. What Are the Requirements to Work for Causeworx? Are You an Independent Contractor or an Employee at Causeworx? At Causeworx you are an independent contractor and responsible for your own taxes. Because it is a Canadian company, you may not receive your 1099 Tax Forms, but you can request an email of earnings. Does Causeworx Hire Workers From Other Countries? Yes, again Causeworx hires worldwide for workers who basically want to work. The company is located in Canada, and you will be calling on behalf of Canadian non-profits. What Are the Hours at Causeworx? The hours will vary depending upon whether you are part-time or full-time. What is the Pay Like at Causeworx? The pay is $11 to $14 per hour plus incentives. This is in Canadian dollars. What is My Overall Impression of Causeworx? There seem to be several happy workers working there at different forums, so I would say overall everyone is happy! I wasn’t able to find any Glassdoor reviews at this time. How Can an Interested Applicant Apply to Causeworx? Call their employment hotline at 844 701 2226 and explain verbally why you would be a good candidate for this position as well as indicate whether you want full-time or part-time. Obviously you will want to leave your name and number too. Then send your resume to hiring@causeworx.ca. Thanks for the update. Things change all the time in the WAH world. The Causeworx hot line phone number has been changed to 844 701 2226. The work is year round. When work-at-home jobs are only season, I do make an effort to mention that in the article. Thanks for clearing that up because that’s very vital to me due to being a stay-at-home mom who honestly needs an additional income in the home. Last question for you. Are the calls inbound or outbound? Hi. Can anyone advise on whether those full-time and part-time hours for this job is seasonal or is it a year-round position they’re offering for at-home workers? Hopefully year-round? Sounds like a splendid opportunity that I am definitely interested in mainly if it is year-round. Thank you. You stated that the starting pay is of Canada’s currency or a pay scale of $11-$14/hr. So does that mean that the starting pay would be the same for United States Agents, or will that convert to U.S. currency, in which I used a currency converter and it calculated our country’s pay from Canada to U.S. of *$8.31-$10.35/hr? @Will – It is adjusted for US clients at $10.00 an hour. sounds great. thanks a lot. Hello there Leisa! Just a note, they are no longer hiring outside of Canada. You must be Canadian to apply for the job. They use Five9 system, which allows you to use a USB and receive calls from your PC or laptop. super-awesome to know. thanks for the clarification, Ms. Good. Hello. Do you know whether or not you’ll be dialing from their system on their software with the USB headset plugged into your computer or dialing the old fashion way, from your landline telephone that’s plugged into the wall? Got a call today from Rachel from Causeworx on 10/02/2015. Training is two full days but you’re only paid for 8 hours. They expect you to always be available to take calls because they calculate that time and pay you according to when you were in a ready state. Management constantly contradicts themself and do not communicate between each other. This team has worked together for over ten years and are painfully unaware how unprofessional they are. I was asked for feedback and then punished when it isn’t all positive. To sum it up, it reminds me of when I worked in a spa where all the female employees were catty and talked behind each other’s back. This management will end your contract over the slightest misstep if they decide they don’t like you. I lasted three weeks. The gmail email account that held information to help defend myself when they ended my contract, was deleted. I received the end of contract notice in my personal email. When I wrote what I thought was an email addressed to the president, I was answered by someone named Ashley. I don’t even know her position because these people sign their emails with smiley faces. Point being, if you can handle being nit picked for every little thing by stay at home mom’s “living the dream” then this job is for you. That is, until they decide it isn’t. I was wanting to apply and when I called the number it gave me something almost like a cellphone voicemail greeting and prompted me to leave a message, does this sound like the correct process? Thank you. Do you mind elaborating on this. How long have you worked for them? I have an interview today….Thank you for your honest input. Thank you Leisa for the excellent review! We like our company too! Please apply, I’d love to hear from you! @Anna Mae – You are welcome. I love reviewing companies that seem very promising. Thank you for the offer; however, I have enough to do running my virtual assistant and career coaching businesses. If things should change, I would definitely consider your awesome company! 😉 Keep up the great work!